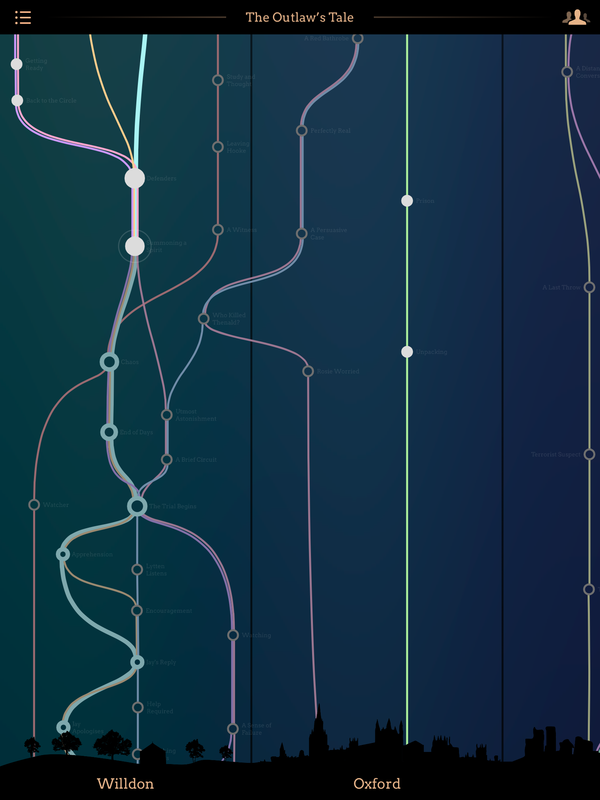 I began Arcadia – a novel conceived and written for an app – over four and a half years ago when a lot of people were musing about digital narrative. After working my way through three publishers, two designers, four sets of coders and a lot of anguish, I am no longer surprised that few others have done anything about it. Thus Iain Pears , on why his latest novel is an app and why it took so long to build. His “few others have done anything about it” is characteristically dismissive and makes me grit my teeth. There is so much going on in digital narrative and related fields that it’s challenging to keep up with the variety. What Pears apparently means is that few novelists with London literary agents have done anything with digital narrative, and possibly that he doesn’t regard anything outside that circle as worth checking out. That is his prerogative, but a little more awareness of the world outside might have brought tools to his attention that would have lightened the workload. It is true, though, that Arcadia is different in structure, scope, and conception from a lot of other interactive literature. The piece is a series of short scenes about many different characters, together with an app whose narrative map allows the reader to follow one character at a time or leap across time to seek the answers to questions. This puts it in a category with Snake Game and The Strangely-Browne Episode in that it is primarily letting the reader choose a course through the story, not alter the plot itself: it is not linear and the reader does have important agency, but that agency affects the reading experience, not the development of events. Further, Arcadia takes place in three separate settings — Oxford of the 1950s and early 60s, a fantasy world invented by one of the Oxonian characters, and a technocratic dystopia of the future — though over the course of the plot, the reader may come to question whether these are in fact alternate universes and whether the fictional world is less real than our own. Another reading strategy might be to read all the events in one setting first, then pursue those in another. Pears has said that he wants reviewers to focus on the content of the work and not on its structure, and that he wanted the app to avoid being gimmicky and flashy. It does succeed in being fairly transparent, but I have a few thoughts about it nonetheless, before I go on to the content or the structure of the piece. 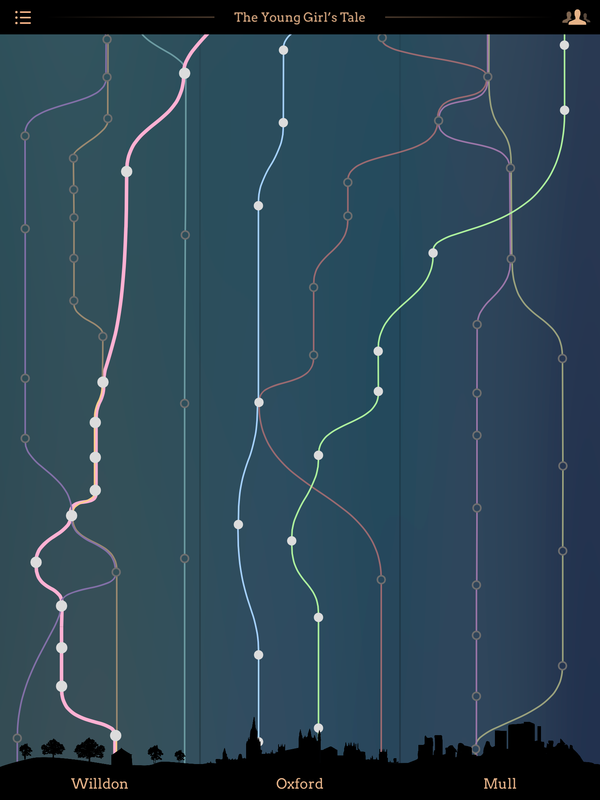 The app’s narrative map reveals some intriguing things if you study it carefully. One line splits in two when a character is in two places at once. (This is a story of time travel and alternate universes, after all.) Elsewhere a fresh line comes into being when a new character is introduced to the story. Crises in the story are evident because so many character threads come together and intertwine. …and you have to swipe sideways in that last quarter of the screen to check out what the alternative continuations might be. It’s understated, even possible to miss. In this particular case it is both striking and narratively important that either of your two next pages will belong to the Young Girl’s Tale, but you don’t see this at a glance. I could see aesthetic arguments for playing this subtle, but I think I myself would have preferred something that more clearly showed what was happening at this moment. Meanwhile, once you’ve started reading a new chapter, you can’t jump sideways to any of its siblings unless you first go back to the top-level map. That’s something that I often would have liked to do. And if you swipe to go back a page when there are multiple strands leading to where you are, you also don’t get a choice of which backward step to take. At least once, I’m pretty sure I tried to back up to a vignette I’d just been reading but accidentally switched tracks and wound up confusing myself further. So the navigation here, while conforming somewhat to Pears’ declared desire for simplicity, did still miss some functionality I would have liked to have. There are many, many possible ways to read this — by which I mean not just that the combinatorial numbers are large, but that there are multiple reading strategies one might pursue. Follow one character to the end first? Read about events in one of the settings, then go to a different one? Switch back and forth between strands frequently, to try to get contemporary events at the same time? I experimented with several of the characters, but soon settled on the story of Angela Meerson, a time-traveling scientist whose experiments in the future apparently precipitate a lot of the rest of what happens — though of course, as always with a time travel story, the question of cause and effect becomes rather tangled. Minor characters can become major ones at will, and central characters become bystanders equally easily. In my readthrough, Meerson took on a primacy that she might not have for other readers. I chose to start with her because I thought her understanding of events would be the most authoritative, and would then give me the structure that would let me understand the more subjective, confused, and often emotionally richer experiences of the other characters. Her scenes are also, uniquely, narrated in the first person when she is alone. I then filled in a lot of the events set in Oxford and in Willdon (the main scene of action in the fantasy universe of Anterwold), and last of all the strands for the characters who remain in Angela’s future world. Here, again, I was chasing the bits of the text that I thought might answer whatever questions I had next. I can also see, though, why one might start with Lytten, the 1960s don-and-spy living in North Oxford who has designed Anterwold. We first meet him telling his story to a group of Inkling-likes in a setting not obviously distinguishable from the Eagle and Child, though a few years after the historical Inklings had stopped meeting there. He is friends with Tolkien and impatient with Lewis, and his comments on both sound a lot like authorial ventriloquism. Of all the characters, he seems most likely to offer Pears’ own perspective on events. That these diverse reading approaches work is a tribute to Pears’ meticulous construction. The storyline of each character does make sense read through by itself, though it may appear full of startling coincidences. Each character line does come to an emotional conclusion. But the book is also seeded with hints of what might be found elsewhere. Towards the end of the Willdon section, a character mentions that there is a long story to explain something she has done, and it was immediately evident where I should go look for that explanation. Elsewhere there is a mystery laid out so that you might discover either the culprit or the significance of the act, but not both at once. It remains mysterious regardless of which end is up. The effect is also down to Pears cheating — or, at least, not quite keeping the implicit promise of the narrative design. You can follow most of the characters from one vignette to another using the narrative map, but there are a few who go uncharted, including one very significant character. Above all, the way the strands of story could be mixed or kept separate offered a liberation from those shackles known as genres… It is a spy story, a fantasy, a historical novel, a romance, a mythology and a work of science fiction. It is a meditation on literature and narrative, or just a light-hearted romp. Naturally that means that one strand or another, one theme or another, may displease. But you can always leave that bit out. I dispute the last part. There is some interactive work whose formal qualities encourage a complete reading, and some that makes such a reading unrewarding or impossible. Arcadia is of the first kind, overtly mapping all of its content and marking off the parts that you’ve completed so far. Nor does its structure provide a single unified goal for the reader. This isn’t a Her Story experience in which you can decide you know enough about the main mystery and declare yourself done. There’s too much going on, some questions the reader won’t even know about until she’s explored a lot of territory. Meanwhile, the random access to content means that it’s not necessary to reread old material in order to reach the new. I could in theory have left out some of it, but then I wouldn’t feel that I’d finished it or was qualified to review it. More than that, though, the genre portions don’t stand on their own. This is not a complaint: on the contrary, I consider it the key to the whole the book. Elements that appear as generic tropes often have additional, external causes to prop them up in other parts of the timeline. In the fantasy portion of the story, Rosie — a girl of 15 — meets a Robin Hood-like character in the woods and they fall in love at first sight. Their love then becomes a significant driver of the plot. The lack of emotional complication between them makes for a weak and watery romance, and the story arc applies rules to human interaction that aren’t borne out in the rest of the novel. Elsewhere in Arcadia the same girl behaves with more realism and ambiguity, especially when she’s in Oxford. Elsewhere, romantic love is treated as a more complicated thing than an exchange of glances between teenagers in a sun-dappled wood. But Professor Lytten has written that the pair falls in love, and that can be taken as causality if we like. Or we could go back further and say that the cause lies in what Lytten himself has been reading. The similarity of names and incidents makes clear that he has drawn heavily on the plot of As You Like It, and that Willdon and its surrounding woods are a recasting of Wilton House and the Forest of Arden. Entering Lytten’s fantasy universe, Rosie has become Rosalind, idealized and perfected and beautified, through a reverse-Galatea effect; indeed, it is literally the fact that she has been made over with local finery and cosmetics that prevents her from easily returning home. Her idealization makes her capable of this idealized love affair. Rosie/Rosalind’s love story is interesting not as a romance in itself, but because of the ways it bleeds over between romance and other types of literature. I could say similar things about many of the other genres represented here. There’s a spy story that overtly mimics le Carré’s Smiley work , but it is not on its own extended enough or complex enough to produce the same satisfaction as a Smiley plot. The stakes are different, too. Le Carré’s stories exist in a world of subtle, long-game jockeying between superpowers, in which it matters very much who is employed where in the intelligence services. Smiley rarely risks the immediate outbreak of war. The stakes for Smiley are more usually about whether he can find a mole in his own service, whether he can believe packets of intelligence about Black Sea troop deployment, whether personal animosities and love affairs are distorting the signal. 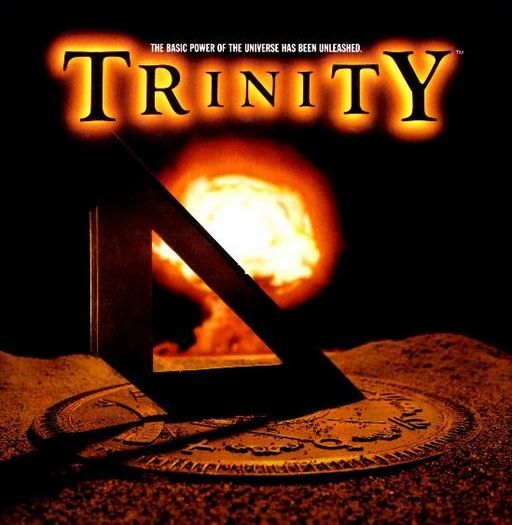 Arcadia gives us a taste of the mole-in-your-own-service plot, but two or three plot-strands to the right, science fiction characters are discussing the possibility of sending nuclear bombs through Meerson’s machine. Which of these things will ultimately determine whether the 1960s avoid nuclear holocaust? Both, perhaps, without either one being the primary cause. This is an answer that works if the book is read as a whole. It is far less satisfactory from any one genre perspective, and — far from wanting to pick my favorite genres as though Arcadia were a story buffet — I found my enjoyment of each section as a genre exercise more or less inversely proportional to how much I otherwise read in that genre. This is not failing of the book, but rather one of its central points. No one genre is an adequate lens through which to understand either literature or life. And just as Arcadia questions the flow of temporal cause and effect, it asks us to consider cause and effect between stories and reality. Do we tell stories the way we do because of what we’ve seen in life? Do we act as we act because of the stories we’ve constructed around our actions? What genre of story do we even imagine ourselves to inhabit? What are the antecedents of our personal stories? I think Pears is wrong that we can meaningfully read Arcadia by picking out just the genre elements we like, but correct that we do often live our lives that way, narrating our own lives variously as farce, tragedy, romance. In Pears’ Lytten’s Willdon society, advocates form judicial arguments by analogy with other stories, even to the exclusion of real-life evidence. Elsewhere, Lytten reflects on how utopian literature can only work if it takes into account human failings and does not presuppose an improved, nonviolent, greed-free type of human being as the foundation of its improved social order. Against this, we are also shown the future dystopia of Angela Meerson, a society in which all the artwork and archives of the past have been crammed together into a single vast building with terrible indexing, because practically no one retains any interest in it. All of these are unhealthy states. Arcadia glances back at the valley of the shadow of death from the mountain pass on the far side. Though the time travel raises the threat that this happy state will be undone, it leaves us at the end safe in our own timeline. Instead, Arcadia‘s future is a bloodless technocracy. Most of the population is drugged with mood stabilizers, romantic love is taboo, no one studies the past, and almost no one goes outside. It’s more Brave New World than Fallout or even 1984. There’s a reference to one character knowing that it has been raining lately only because he’s seen it on the news. Climate change and pollution have wiped out most non-human species except those cultivated for food, while the human population of the earth has climbed to the tens of billions, and only ruthless efficiency keeps everyone from starving. Lytten’s colleague in 1960 imagines a technocratic utopia very much like this, and there are just occasional suggestions that this future is itself came about through invention rather than historical accident — but then, aren’t we in fact inventing the future all the time? Isn’t that what utopian writing is about, at least in part, trying to imagine a system that will be better than the one we have now? I did not entirely find Pears’ dystopia persuasive as an extrapolation of the present. Population growth is falling as economic conditions and female education rates improve. I personally think we have more to worry about from climatic disturbances, temperature change, lost agricultural land and fresh water, and from the resulting wars and refugee crises, than from overpopulation per se. But perhaps all this means is that my fears are not Pears’ fears. The fact of the fear is more important. Even when we have escaped one future — I really did think we would all be killed by bombs, when I was a child — there is another existential threat on the horizon. Even in the fantasy world of Willdon, hermits tell prophecies of an end time to come. Arcadia is a heavy name to give to any book. To me it suggests the Greek territory of Arcadia, a rough and rustic place when much of the rest of Greece was settled into cities; or a bucolic Virgilian scene of shepherds singing love songs over sheep’s cheese and honey. 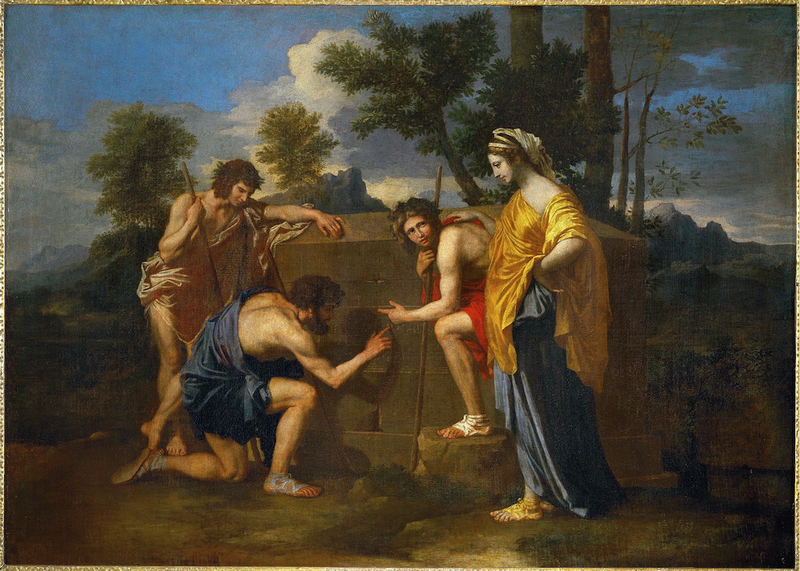 Then there is Poussin’s painting Et in Arcadia ego, in which shepherds gather above a tombstone with this inscription. The Latin inscription is probably most grammatically translated “even in Arcadia, I exist,” and the “ego” in question is Death, by analogy with earlier works on the same theme. But Erwin Panofsky’s essay on Poussin defends reading the text differently on the basis of the image, something more like “I [the buried person] also lived in Arcadia,” and as part of an ongoing shift in how the line is interpreted in art and literature. The painting is thus ambiguously a memento mori or a recollection of a happy life seen in retrospect. THOMASINA: ….the enemy who burned the great library of Alexandria without so much as a fine for all that is overdue. Oh, Septimus! — can you bear it? All the lost plays of the Athenians! Two hundred at least by Aeschylus, Sophocles, Euripides — thousands of poems — Aristotle’s own library!….How can we sleep for grief? One of the chief mysteries in Stoppard’s Arcadia concerns the identity of a hermit who lived on the grounds of the 19th century estate and left behind mysterious mathematical writings later researched by someone in the 20th. Other significant developments pertain to a book of dreadful poetry (“The Couch of Eros”) and the misinterpreted criticism and letters relating to it. A hermit of hidden identity, the threat of burning a library, coincidental and fragmentary evidence, and the mathematical manuscript out of its time appear in Pears’ Arcadia as well. “Arcadia” is an overloaded symbol: timeless and ancient, idyllic and deadly, innocent and sexual. It is an alternate, classical Eden; it is the delusion of reactionaries and Luddites; it is the green Shire; it is the offensively ignorant fantasy of rich people about the simple pleasures of the poor. It is Marie Antoinette’s “peasant village” on the grounds of Versailles. It is an endless summer afternoon, eternity in a moment, as viewed by a population governed by Pomodoro timers and pastured on Kraft. Tranquility as the exotic Other. Simultaneously the title points to other art about the meaning of art. Panofsky is foundational to the study of iconography and iconology; Stoppard’s Arcadia reminds us that art is preserved not by default but by a combination of luck and the conscious efforts of those who (even misguidedly) love it. The readers, translators, adapters, interpreters, students, copyists, and thieves of art take turns to add to its meaning, actively modifying rather than passively receiving. 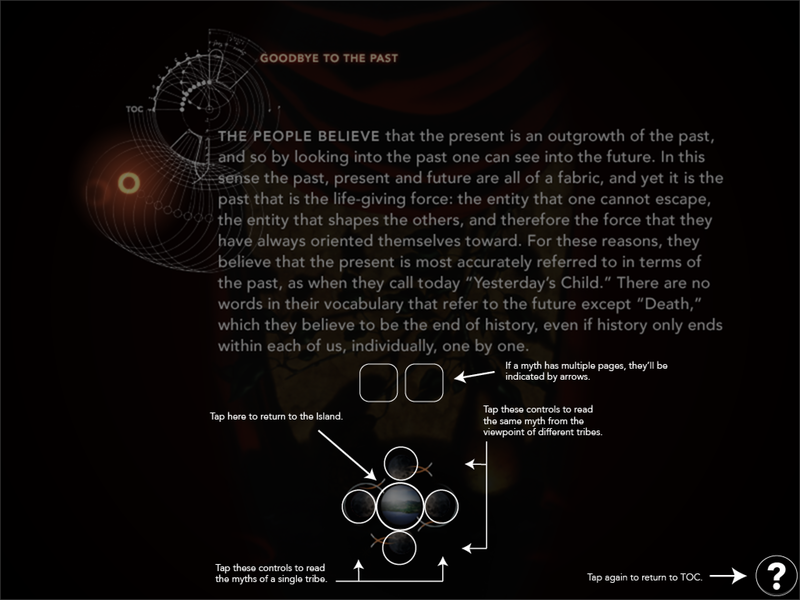 Steve Tomasula’s TOC is a new media story about the nature of time. It’s been out for a few years, but was remastered for iPad in 2014. TOC is glossy and gimmick-driven in ways that Pears repudiates: there are audio and video clips, there are passages of text that you can read only through a porthole in the screen, there are handsome animated drawings side by side with semi-competent 3D-rendered machinery. The interface is so varied and inscrutable that the help button produces an overlay explaining where to tap the screen — a clear sign that your UI is falling short, and very far from the legible simplicity of the Arcadia app. If you choose to vote in favor of Chronos, you may watch through a long continuous video concerning a Vogue model whose husband has been seriously injured. The path of Logos, on the other hand, invites you to tap spots on a rolling player piano roll, unlocking fragments of text and video. The former mechanic is linear and low-agency; the latter, chaotic but still low-agency, since you never know before you tap what information you’re going to evoke. In this respect Arcadia offers much more control over your experience, if no control over what the characters actually do. TOC‘s interface produces anxiety — the primary contribution of the player piano roll is the likelihood of missing out — and this anxiety is part of what we are supposed to understand about Logos. It is a method we see in other dynamic fiction, eliciting an emotional response from the reader through its interaction mode as much as or even more than through the content itself. 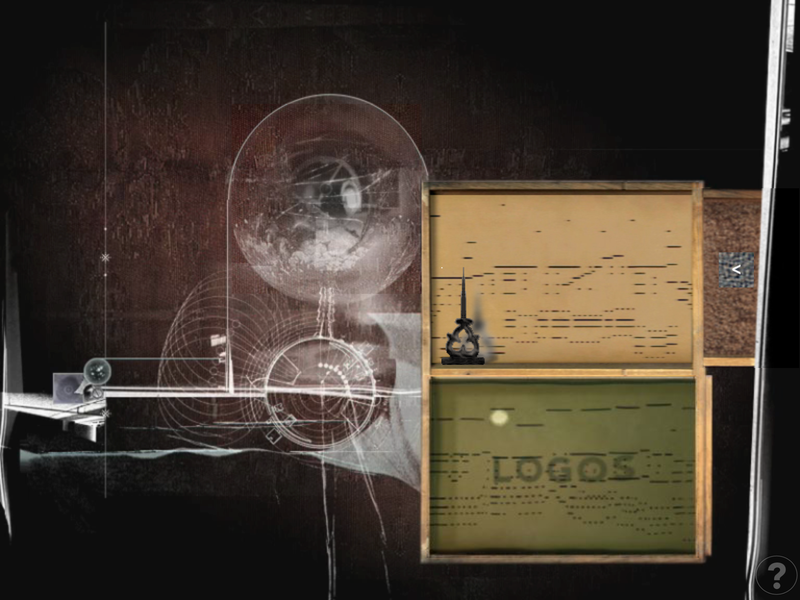 The passages associated with Logos tell of the creation of an Influencing Machine, possibly the same as its Difference Engine, which is neither exactly a computer nor exactly a clock, and which possesses the ability to stop, hoard, and manipulate time, but never in ways that humans find satisfactory. Most of these fragments are presented as fables; others are extracts from the work of Zoe Beloff‘s THE INFLUENCING MACHINE OF MISS NATALIJA A. From there, the story goes on to deal with an island inhabited by the Tic and Toc peoples, who have mirror-image versions of the same ideas about time and its passage. The interface here allows you to move from one myth to another myth told by the same people, or the same myth as it is told by the opposite people. Ultimately, TOC suggests that we don’t understand what Time is, that we can’t do without it, and that it is an oppression. Some of the Logos stories tell of masters who use their pocket watches to control and manage servants, keeping your master’s time rather than your own being one of the misfortunes brought about by time-keeping. The style of TOC is abstract, florid, and heavy-handed, not entirely to my taste. I did find some of its individual images memorable, almost Momo-esque: the characters who have tiny hourglasses in their fingernails, the man who digs a deep hole in order to descend into the past. One of the key themes in TOC is the longing to escape from the urgent demands of linear time, and in particular the productivity-every-second timekeeping required by a modern post-industrial society, into some form of existence that allows rest and tranquility. American work culture, especially, is terrible about this: vacation is minimized, and no hour of the day or night, no day of the year is too sacred for an employer to demand overtime. No feast days or fast days or days of abstinence intrude. Arcadia acknowledges this longing and simultaneously admits it as a trap. Lytten’s Willdon is so detached from linear time that its English-derived language has lost tense markers. There are yearly festivals and seasons, but there are no annals and no way of marking dates from one year to the next. This is part of what makes it idyllic, but also the reason why people never think for themselves, never ask questions, never move beyond tradition, never advance. It is very likely that we will not read Arcadia in chronological order; likely that whatever reading strategy we choose will involve visiting different points in the timeline again and again. This reduces the sense that the ending is the most important part of the story, or that it constitutes a full verdict on everything else. In all storylines, Arcadia ends with the coming of evening. It is the conclusion for those who are looking forward to a happy future, for those who are dying, for those who are taking on a difficult new task. It works in this role because of the overloaded symbolism of evening, the time of endings and rest, the time for relaxation and sleep, the bringer of new plans. “Morning is the best counselor,” said the characters in my childhood fairy books: face a predicament by going to bed. Some of the other vignettes work this way too, though across fewer lines at once: events that mean one thing in one character’s timeline and quite a different thing to someone else, events that belong simultaneously to two genres and therefore are functioning differently depending on context. It’s a more extensive and subtler version of the death scene in What Lies Beneath the Clock Tower, where the protagonist’s relationship to the dead depends on what route the reader took to reach this moment. One of the curious effects of this is that the more central a character becomes, the more they overlap with other people’s storylines and the more their subjectivity vanishes, their inner thoughts described less and less in order to make more and more room for the people sharing their stage. This happens especially much to Rosalind, who is a key character but seldom alone for the last quarter of the book. In this way the structure of Arcadia accords with the content. The characters of Willdon are constantly interpreting and reapplying bits of remembered story, treating literary criticism and jurisprudence as the same occupation, loading old texts with more meaning than they were originally meant to bear. 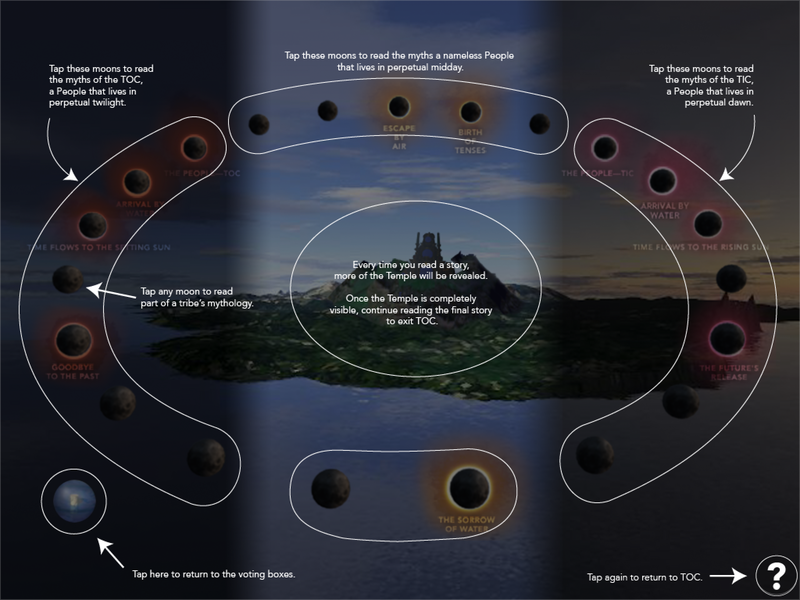 One of the main plot elements of the story concerns a manuscript written in Tsou, an invented script that relies on overloaded symbols to convey information compactly. It looks so odd that people have nicknamed it “the devil’s handwriting.” Only very well-trained people who are concentrating hard can read or write in Tsou, and a small error will change the whole meaning of a Tsou document. All of this is why I’m inclined to reject what Pears says about letting people pick their favorite characters and genres out of his novel, or about wanting the structure to be invisible. The diverse meanings of the text are important, and we perceive the multiplicity best if we see all the strands. The reader’s choice of a reading strategy also matters, but choosing a reading strategy does not have to mean skipping bits. Read Arcadia, read the whole thing, read the form as well as the words. It has more to say that way. Whatever his views on digital narrative in general, and however little he may be acquainted with the rest of the field, Pears has written something substantive that makes a powerful use of the medium. A culture of hard work and providence for the future, a desire for progress, empathy for the suffering of others, and an urgency for a better world: I think of these as good things. Still, they can generate a lot of grief, exhaustion, and anxiety. They can suggest that happiness in the present is either ignorant or sociopathic. But it is horrible to live like that, excusing a little self-care from time to time in order to restore one’s strength for the struggle, never really relaxing into joy. The end of Angela Meerson’s storyline sees her heading to Provence to resume her studies, hoping but not necessarily expecting to prevent disaster. It is nonetheless a surprisingly upbeat chapter, the one that became for me the lynch pin of the whole book, and the one I reread last after I had finished everything else. She is happy in that moment, kairos detached from chronos, despite all the contingencies and dangers. There is no other way to be happy. It is the prospect of death that makes it moral to claim Arcadia when we can. 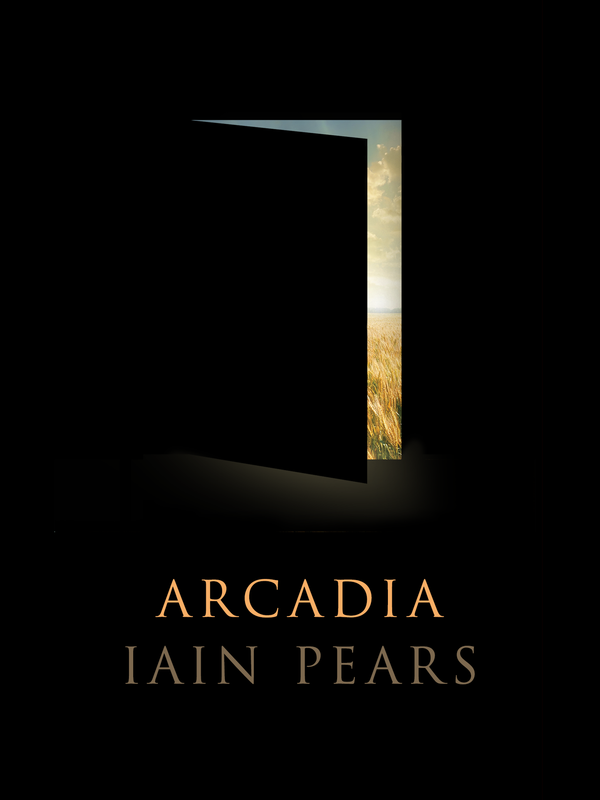 Other writing about Arcadia: Sydney Morning Herald, Spectator, Oxford Times. Other writing about TOC: Illya Szilak provides a more detailed breakdown of its structure, including diagrams; electronic book review has extensive coverage of his work; and here is an interview with Tomasula on his work. This entry was posted in books, ebooks, mobile platforms, Reviews and tagged arcadia, iain pears, navigable fiction, plot mapping, poussin, steve tomasula, toc by Emily Short. Bookmark the permalink. … letting the reader choose a course through the story, not alter the plot itself: it is not linear and the reader does have important agency, but that agency affects the reading experience, not the development of events. I agree, but I can’t decide whether the term should include Oulipian random access works, or things like Cortazar’s Hopscotch, where there are two paths both pre-designed by the author. “Do we tell stories the way we do because of what we’ve seen in life? Do we act as we act because of the stories we’ve constructed around our actions? What genre of story do we even imagine ourselves to inhabit? What are the antecedents of our personal stories? I think Pears is wrong that we can meaningfully read Arcadia by picking out just the genre elements we like, but correct that we do often live our lives that way, narrating our own lives variously as farce, tragedy, romance.” I love this. I love Iain Pears, and I had no idea–Goodreads did not tell me–that his new novel had this interactive component. Your criticism of his somewhat blindered description of the field is just (alas, I would expect no better of a bigshot author speaking to a field which has not, formerly, been dominated by bigshot authors–maybe this ego is a thing they grow, a thick bristly hide for protection from perceived faults?) but I’m still excited about this. Thanks for bringing it onto my radar. I read too much into things sometimes, but when Pears suggests to “leave that bit out,” I come to an elaborate series of interpretations. My favorite idea is that Pears is willfully *hoping* that the reader will stick to the parts of the story they like the best, at least at first, and he even dares to recommend it out loud. When the readers do this, they’ll fall into a trap: Their own myopic reading strategy is reflected back to them in the dystopia’s neglected library or the oversimplified romance. The trap doesn’t spring immediately; the reader gradually discovers it as they reflect on their relationship with these themes. After the reader has reconsidered their approach to the story, they’re not left with vague disappointment with themselves; they can go back and look beyond their shallow first pass on the story, finding unexpected rewards in the parts they had overlooked before. Hi Emily. As someone still relatively new to your essays, I just wanted to say how incredibly thorough, insightful and beautifully written I found this one in particular. I can’t believe something of this quality is free!